Finding a minimum variance portfolio when using a regulariser? where $\rho(. )$ is some arbitrary penalty function (e.g. $\lvert w_i\rvert$). Perhaps you could go through the process step by step as I am getting lost when I try. You're not going to get an analytic formula except in special cases of function $\rho(x)$. And you're probably going to want $\rho$ convex. If $\rho$ is convex, the problem is a convex optimization problem and can be efficiently solved numerically. If $\rho$ isn't convex, the optimization problem may be difficult to solve. If $\rho(x) = |x|$ you basically have the LASSO objective which doesn't have an analytic solution (though the solution can be efficiently found numerically). If $\rho(x) = x^2$, you get a clean formula. And it's essentially the same as your original problem. $\Sigma$ is replaced by $\Sigma + \lambda I$. -- Update -- Motivated by the comment from @noob2, I've attached a simulated example showing how security weights (in case $n = 8$) change as $\lambda$ increases. 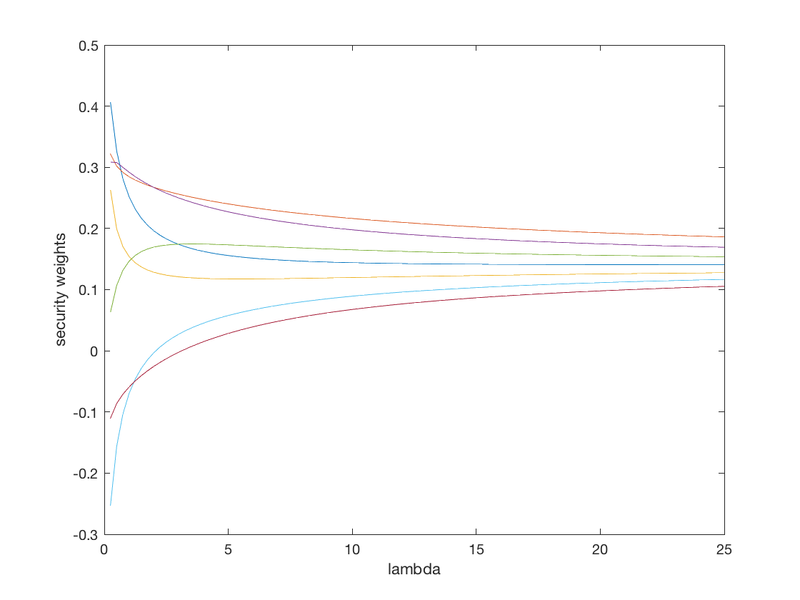 As @noob2 pointed out, higher $\lambda$ pushes weights towards the equal weight portfolio. Not the answer you're looking for? Browse other questions tagged portfolio-optimization modern-portfolio-theory capm covariance minimum-variance or ask your own question. Are minimum-risk and minimum-variance portfolios equivalent? How to calculate a hypothetical minimum-variance point? How to calculate the global minimum variance portfolio in R? What price data should I used when making minimum mean variance portfolio, optimal risky portfolio and efficient frontier using Markowitz?